Nothing says "with this ring, I thee wed" like this spectacular cobalt xf chrome 8mm wave finish wedding band. Manufactured with high polish white gold color cobalt chrome inner surface with a wave finish running the surface of the ring. The use of cobalt chrome as a wedding band is a practical choice to the high cost of precious metals such as silver, gold, and platinum. Cobalt chrome will not fade or tarnish like silver so that the ring will look as great decades after your make your purchase. 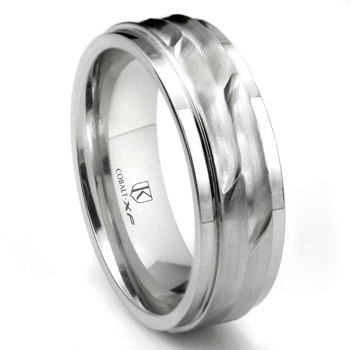 Our cobalt xf chrome 8mm wave finish wedding band is made for the man who works hard, plays hard, and relaxes well. The use of cobalt chrome will offer brides and grooms a very strong wedding band that will not bend, twist, or crush. This ring also is backed by our 100% lifetime warranty so that your ring will last as long as your marriage. We carry a full line of cobalt chrome, titanium, and tungsten jewelry such as bracelets, necklaces, and pendants.